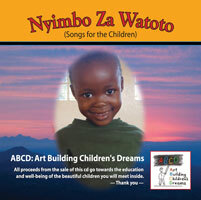 ABCD: Art Building Children’s Dreams has a CD of wonderful original music with which we can raise funds for the children. It’s called NYIMBO ZA WATOTO (Songs for the Children). Local musicians/songwriters were found who graciously agreed to donate a song or two. Colin MacDonald, came on board to donate the great artwork and design. Mastering of the CD was done by Sam Reid of Slip One Digital and a former member of Glass Tiger. It’s an exciting eclectic mix of musical genres ranging from ballads, to klesmer/reggae, to indie vocals, to hot latin beats, to electronic instrumental rhythms, to an African folk song by Canadian children. Inside the case is a wonderful booklet which contains all the lyrics of the songs, photos of all the children and a thumbnail artwork by each of them. The booklet itself is a treasure! Use the button on this page to order and pay for a copy via PayPal, or simply email us to order one and pay by cheque. To give you an idea of how the funds can be used: the sale price of $10 (plus $5 for shipping within Canada) pays for a hot school breakfast for a child for ONE YEAR!